The full impact of hay fever is often downplayed but the reality is that hay fever sufferers are more likely to develop asthma than those who don't suffer from hay fever. This likelihood also increases if hay fever is left untreated. Consider that the World Health Organisation has begun the Initiative on Allergic Rhinitis and it's Impact on Asthma. This initiative recognises the relationship between asthma and hay fever and also stresses the importance of early treatment to prevent the occurrence of asthma. The effects on personal health missed work and school as well as the financial costs all mean that the link between hay fever and asthma is not one to take lightly. Hay fever results from your body's immune response to an allergen, such as pollen. Symptoms include a runny nose, watery and bloodshot eyes and itching around the throat and face area. Asthma causes the lung's airways to swell and narrow; symptoms involve wheezing and shortness of breath. Asthma attacks can come on slowly, with symptoms escalating over time or they may begin rather suddenly and can instantly show severe symptoms. Although the same triggers for hay fever can also trigger an asthma attack, those who do suffer from asthma will also have a range of other triggers that don't affect hay fever. One common example would be exercise. Hay fever sufferers must get early treatment and must also monitor and treat their hay fever on a consistent and diligent basis. Sufferers should be aware of asthma symptoms and see their doctor if they notice a worsening of hay fever symptoms or any new allergy symptoms. 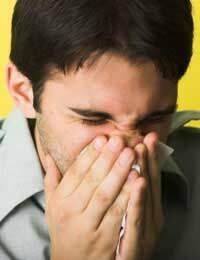 People who suffer from both hay fever and asthma will need to take extra precautions to monitor the conditions. See your doctor and work together to devise the best ways of preventing hay fever symptoms. Strategies will probably include monitoring pollen counts and frequently washing clothes to ensure they are pollen-free. Prevention may also include beginning your medication several weeks before the 'pollen season' begins, which is usually during the spring and lasts through the summer months. Obtain a treatment plan that includes medication and perhaps alternative remedies, so that you are able to treat those symptoms that do occur. If you currently suffer from both hay fever and asthma, you will need to take extra care in preventing hay fever, as hay fever symptoms can worsen your asthma and trigger an attack. Your doctor will likely have conducted allergy tests to pinpoint your particular allergens. Most of the general tips that apply for preventing hay fever will similarly apply for preventing an asthma attack-this includes avoidance or reduction of the identified allergen and possible identification of new allergens if you find that symptoms are still occurring. You will also have other triggers that are unique to your asthma and these must be avoided to ensure that your asthma is kept under control. Hay fever and asthma are challenging conditions to treat on their own, but when combined, they do require additional monitoring. If you only suffer from hay fever, you still need to manage your symptoms regularly to prevent complications and reduce the chances of developing asthma in the future. Eventually, it will become easier to manage your symptoms as you integrate prevention and treatment tips into your lifestyle. This will ensure that you continue to take care of your health but will let you focus on enjoying your life each day, without constant worry about your hay fever or asthma.